Velimir Braculj er engasjert som trener i Kolbotn Volleyball ut året med mulighet for forlengelse. Han kommer til å trene damelaget mandag og onsdag i tillegg til å trene lag i yngre årstrinn mandag, onsdag, torsdag og fredag. Velimir starter som trener mandag 5. september. Velimir er 34 år og utdannet innen volleyball med tittelen «Master of Sport and Physical Education» fra fakultetet for idrett og kroppsøving i Novi Sad som er nest største by i Serbia. Han startet å spille volleyball i sin hjemby Sombor når han var 13 år gammel. Som 19-åring trente han med juniorlandslaget i Serbia. Han har også spilt sandvolleyball i Serbia og fungerte som en av trenerne i Region Øst i forbindelse med Regionslaget i sandvolleyball i 2016. De to siste årene har Velimir vært engasjert i Skjeberg VBK men flytter nå til Kolbotn og inn i en loftsleilighet med utsikt over Kolbotnvannet. Etter flere år i Norge har han gode norskkunnskaper selv om det selvsagt er enklere å forstå enn å snakke. Ellers behersker han engelsk. (first league of Serbian republicVojvodina). 1996 – member of invitation’s camp in Karatas. At 17 I was part of the Serbian cadet team and two years later I was invited to play for the junior national team. 1998 – 2003 – member of volleyball club “Sunce” Sombor (first Serbian league). 2002 – 2003 – played Cup of Serbian republic Vojvodina – first place. 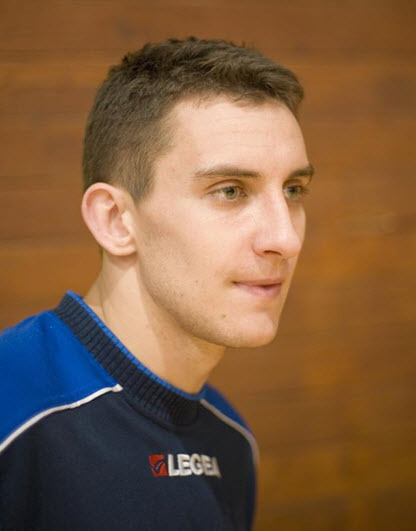 2003 – beginning professional volleyball career with the team known as “ Spartak” Subotica, played for 5 seasons. 2003 – 2008 – member of volleyball club “Spartak” Subotica (first league of Serbia). 2005 – 2006 – qualified for Final Four of Cup of Serbia. 2008 – Moved on to play in Croatia. Now, member of volleyball club “Sisak” in Sisak town, second place on half-season of first league of Croatia. Played Cup of Croatia, Final Four, third place. Best scorer and best attacker of the Cup of Croatia. 2009 – 2011 member of volleyball club “Novi Sad” Novi Sad (first Serbian league). 2011 – 2014 member of volleyball club “Indjija” Indjija (first Serbian league). 2008 – Third place in beach-volley in Serbia and qualification for Balcan championship for Serbian national team. 2005 – 2006 – Second coach of senior women’s team “Spartak” Subotica, first league of Serbia – qualified for Final Four of Serbia and Top Teams of Europe. 2006 – 2008 – Worked as coach of younger team. 2014 – 2016 – Coach Skjeberg VBK, Sarpsborg, Norge.